I’m not sure why, but I’m not a big fan of Valentine’s Day. Don’t get me wrong…I’m all for romance, and smoochin’, and huggin’, and all that stuff. I just don’t get very excited about the day set aside to celebrate it. Maybe because every day is Valentine’s Day around our house! 🙂 That being said, I still think it’s important to gussy up a table for your loved one if you plan to celebrate Valentine’s Day at home, so here’s a “cute, cozy, easy to put together, budget-friendly table for two” as requested by blog reader Estella. The color that always gets hearts beating is red♥♥♥! 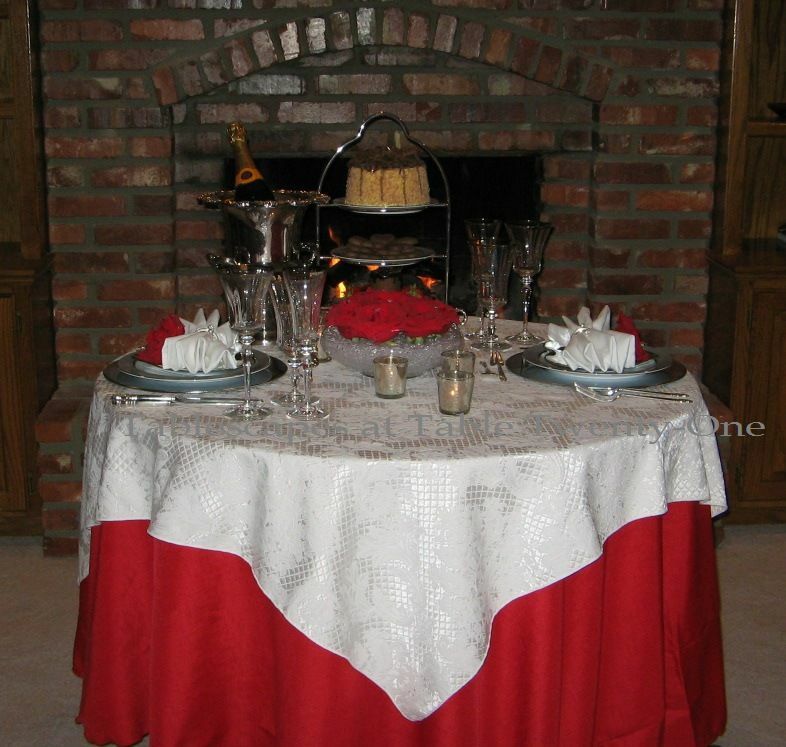 I started this table off with a full-length red linen topped by a quilted damask square. Setting up by the fireplace seems to be both romantic and practical. On the romantic side, it symbolizes the love you have burning in your hearts for one another. Plus, everybody looks better in the glow of amber light! On the practical side, February is still chilly in many areas, so your tootsies will stay nice and warm. Furthermore, if your sweetheart gifts you with a toaster, or a lamp, or something equally disturbing that may as well have “Just Kick Me In the Crotch and Leave Me Down By the River to Die” written on it, you don’t have to get up to get rid of it…just toss it right into the fire! 😉 If he gives you something really crazy like a coupon to a weight loss center or Botox clinic, feel free to toss him in, too! Swish! Three points! 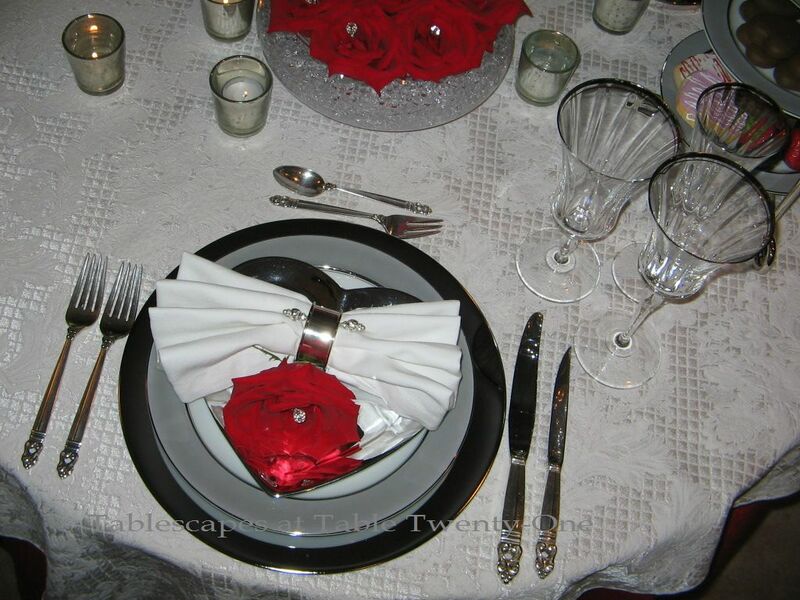 This place setting starts with a shiny silver charger topped with an Easterling “Majestic” dinner plate. A silver heart salad plate finishes off the stack, accompanied by Mikasa’s “Jamestown Platinum” stemware and International Silver “Royal Danish” flatware. 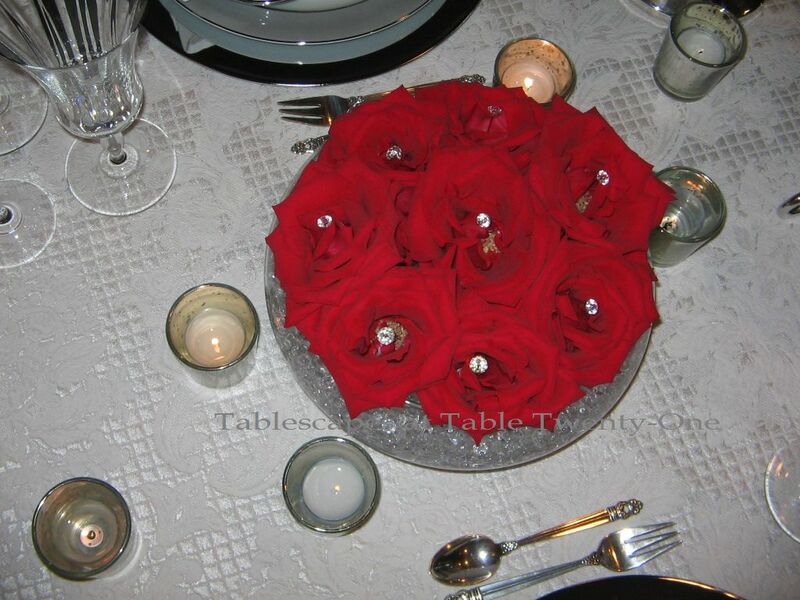 More full-blown red roses are tucked into a bath of sparkly acrylic “ice” and water for the simple centerpiece that takes less than 10 minutes to assemble. The “ice” can be purchased at just about any arts & crafts store like Hobby Lobby or Michaels. (Click HERE to see another floral arrangement using acrylic “ice.”) A more budget-friendly flower choice (especially during February when the price of roses is sky-high!) that provides comparable impact would be fluffy red carnations. A smattering of mercury glass votive holders add ambient light and give the “ice” in the centerpiece a little extra shimmer. 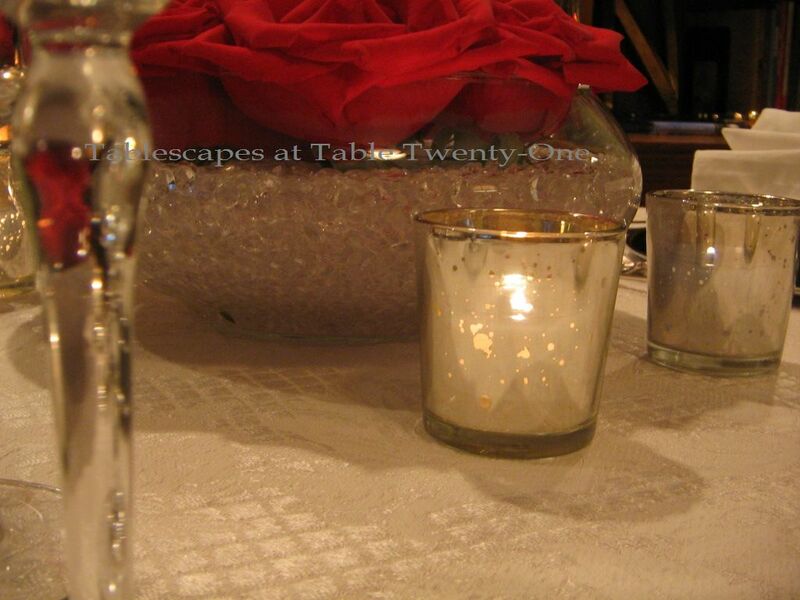 If the fireplace is hot enough for you without the votives, consider using submersible lights in the “ice” instead. Submersible lights can be also purchased at an arts & crafts store or through your florist. All kidding aside, I hope this helps in your planning, Estella. 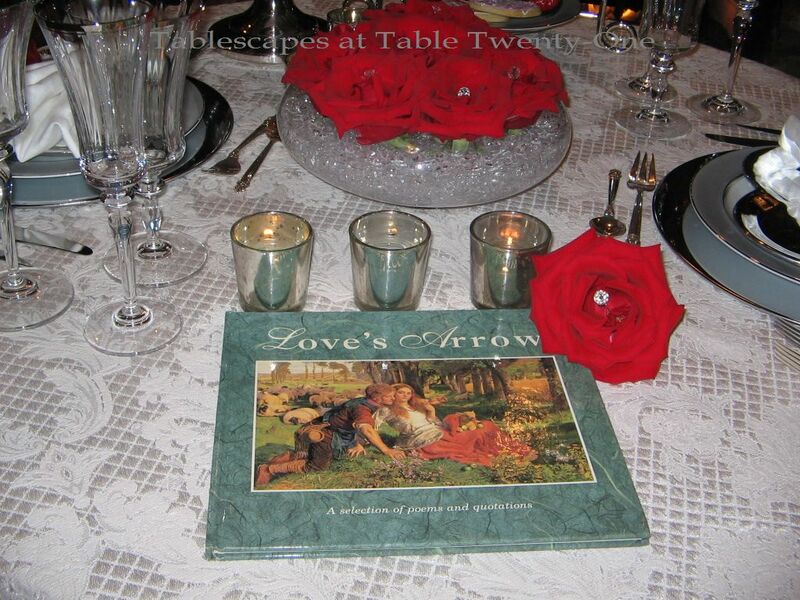 I’ll be back next week with another Valentine’s Day tablescape that has a few more bells & whistles. Meanwhile, I hope you will join me again this Thursday at Susan’s Tablescape Thursday. I’m sure there will be lots of Valentine tables on display from talented bloggers around the world! I don’t do a lot to decorate for Valentines Day either. A few vintage cards and maybe a tablescape for dinner. I like the look you show here, something along the idea of what I plan. Thanks for sharing. Play fair and smile sweetly isn’t always easy if you get something you want to toss in the fire! However this gorgeous setting would warm anyone’s heart. Very elegant and romantic. You are so funny! I chuckled all the way through! My husband calls these events Hallmark holidays! I have guilted him into treating me special on Valentines Day! Hey once a year can’t hurt him!! I’m still dreaming of a yellow/canary diamond ring!! Back to your table! I love that white tablecloth- it’s so elegant. I don’t remember seeing the name of where you order tablecloths from but I’ve used Bright Settings for a few. I have an odd 42″ round kitchen table and a lot of tableclothes are too big so I’ve used them for a few custom ones. Love the mercur votives too- they have such a pretty look and they aren’t too costly to buy! The roses look pretty with the stick pins! I would never have thought of that! Im going to have to try some of that acrylic ice! Your cake and snacks look soo good! I’ll be right over for coffee and cake!! I love the table you have set for two. I love the red cloth and how you topped it with the white. Very elegant. Love the detail on the end of the flatware. I think I might just have to set us a little table for two and fix him a nice dinner and thank him for all of the Valentine’s Day’s that he has not gotten me vacuum cleaner or a toaster! It’s just another day here, but in blogland, it is big! I am for anything to celebrate in February, Ground Hog’s Day doesn’t inspire me much! Although I do think I did a groundhog table last year! 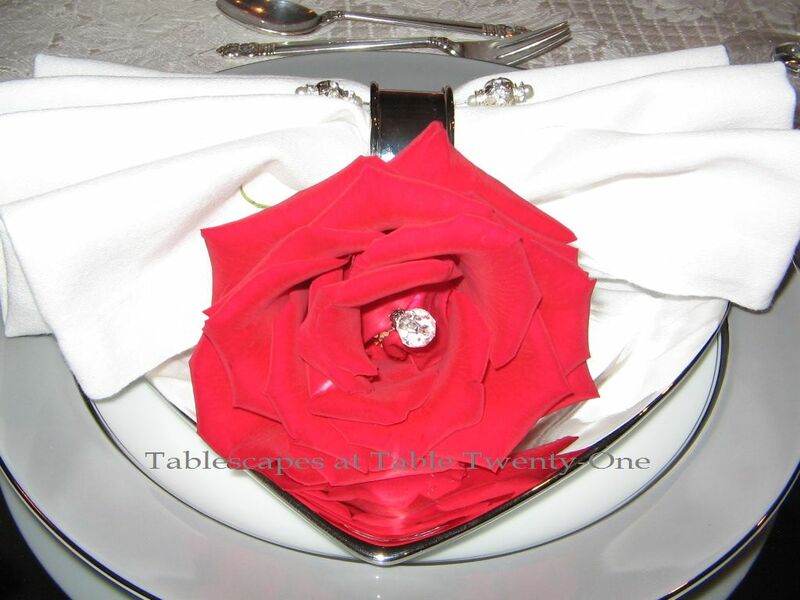 Love this romantic table for 2, the blingy roses are so pretty. Still recovering from your previous post. I thought Alma was bad with her dish room, you have a dish house! Beautifully done as always and I just LOVE your sense of HUMOR. Alycia, you are so adorable and funny. It’s always a pleasure to read and see your posts. Your Valentine table is lovely. I really like the acrylic ice. Beautiful bling on the napkins too! I like how you draped 2 different table cloths. I think having dinner in front of the fireplace is so romantic and cozy. ohhhh…this is purty Missy! you just give us girls all kinds of ideas…bling in roses, acrylic ice for our fresh flowers, unwanted gifts directly into fireplace…that is just good stuff! I am so going to do this flower technique, its beautiful without a doubt…and I so need some of those silver chargers…hook up please! These are a few of my favorite things–red anything, bling, bling on red flowers, strawberries, chocolate, champagne, mercury glass, did I say bling?!! I agree, no vacuum cleaners for me!! But diamonds always work lol! 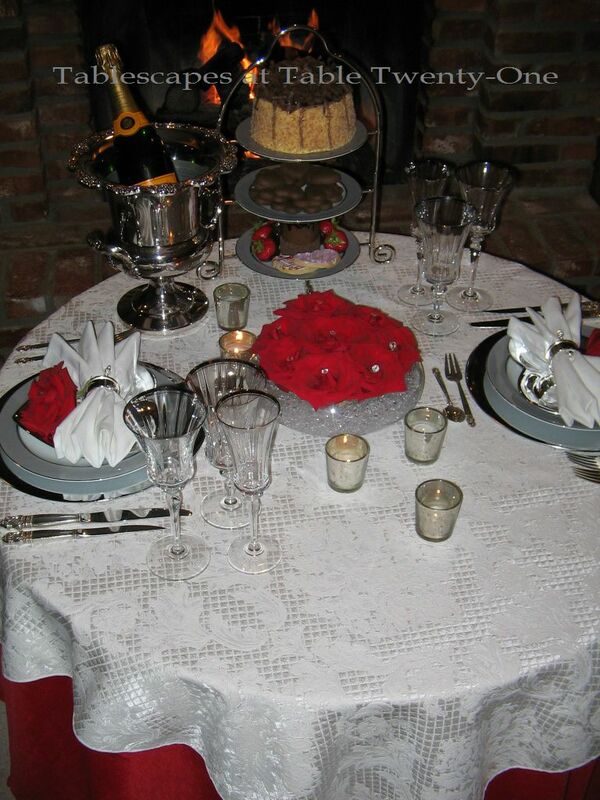 Very romantic and beautiful, love that Royal Danish flatware… and those little heart salad plates are just darling. I think I’ve recovered from your last post, it certainly has helped with my guilty conscience. I went shopping today!! lol Love the table!! You are so funny, you should be on TV! I love the idea of being near the fireplace just in case — just toss it in the fire! You may not be a big fan of Valentine’s Day, but you totally scored with this table. (I agree that every day is Valentine’s Day, too.) I love that centerpiece so much. It’s my favorite part of the table. Well, that and the place setting… and the fact that you set it in front of the fireplace. And you made me literally laugh out loud about the stick pins…. LOL @ coupon for weight loss and botox. You are so funny. Beautiful table – love everything! Great ideas!!! Love all the mercury glass.